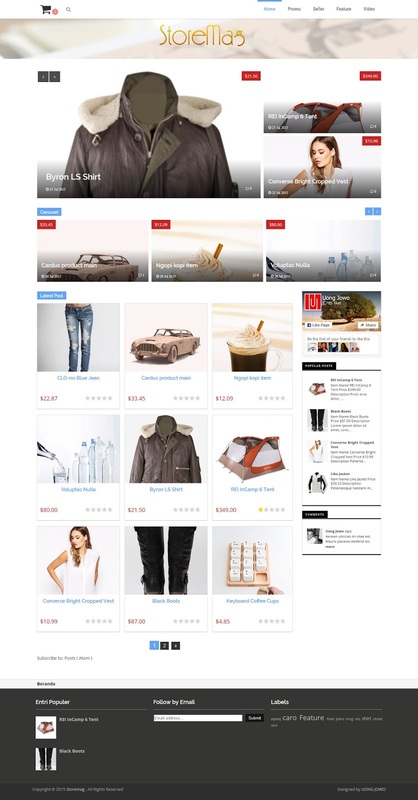 Designed by Uong Jowo, Storemag is online shop blogger template. This template is best suitable for any online product store, online shop or any eCommerce website. Fully responsive layout design makes the theme an ideal website template for promoting and selling product. Brillinat work oungjow Very Nice Template.... Email me this theme TO my email : NabeelNasir1@hotmail.com... Thanks. Brillinat work oungjow Very Nice Template.... Email me this theme TO my email : mnabeelali1@gmail.com... Thanks. Please can you send it at inweb.hellas@gmail.com ? Hi! Can you share this template with me? Can I borrow this one my friend? Good afternoon (in Brazil), please send me the link. sent me hoangnghiathanh@gmail.com ! Thank you very much ! Great Template, Love it !! asslm..kalo cara utuk memasukin/pos barang nya gmana ya kang mas ? Hi. Could I use this template on my blogger? Please email it to me at sayhello@alyhan.com. Terima kasih banyak! saya ingin usaha online, terima kasih. Please send for me: maikda87@gmail.com - Thank so much! send me, sergiocteixeira@iol.pt , thanks! Thanks for providing this amazing template,hope so that this will definitely work for me. If anyone is going to start his online business then he must check the after effects templates. I m sure that this will definitely work for you, as I found it really very helpful. These templates are more interactive and effective then any other normal designs. pliss minta tempatenya om wong jowo, saya riyo dari semarang boleh dikirim ke riyocomel@gmail.com ? Please can you send it at patriota1999@gmail.com ? this is great template! Thanks. keren.. gmna cara ngilangin "add to cart"nya ya mas?? This template is very excellent and usefull. I very respect and admire you. Can I borrow this one for my friend ? Menawi panjenengan longgar, kula nyuwun template pak. Bismillah, kalo boleh minta copy templatenya, akhiy..
Kindly send this template for my own use. Please can you send it at kwswebdesigns@gmail.com ? Nice template, could you please send to me at dedistea@gmail.com? i like it can u send it to me please. untuk mengganti kategori pada slide dan carousel gmn? Assalam. Mas. Saya juga mau pakei. Please, can you send it at smart.epixeirein@gmail.com ?